Would You Want Skyward Sword Delayed for Project Café? IGN posed this question to their readers, weighing the benefits and talking how business-wise it actually makes sense. We recently heard the rumors that Skyward Sword is under consideration for a possible delay, but we never really discussed whether this would be a good move. While the most resounding answer is likely to be no, just think about what you’re saying no to. 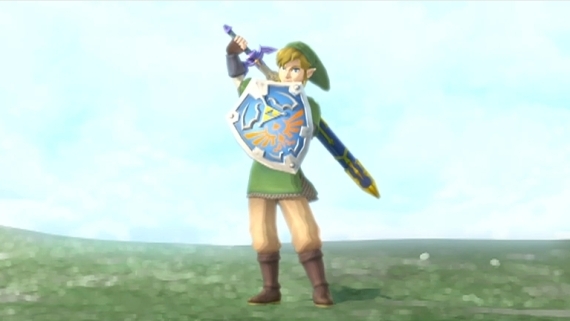 If you look at Skyward Sword‘s impressionistic graphics wouldn’t you agree that they would look gorgeous in HD? That’s exactly what you would get if the game is delayed to be a launch title. This is a tough subject to tackle because we’ve been waiting almost five years for a new console Zelda, which is forever by Zelda‘s own standards. My first reaction is “no, I want this game tomorrow,” but then I start to let logic set in. If Nintendo has possibly planned Project Café to be an early 2012 release (a la 3DS), they would need a killer big game software app to help push sales. It sure worked with the Wii, so why not do it yet again? Heck, at least this time the improvements would actually be noticeable. Even if it’s a late 2012 release, they still need to ensure they have at least one major title out the gate, and a title that will entice the more “mature” gamer to buy their system. Zelda does that perfectly. It worked with the Wii, so it would naturally work with a system “mature” gamers actually want to own. Still, while this may be the smartest business move it still begs the question if you would personally want this to happen. We’re already getting a another release of Link’s Awakening, and we’ll have a ramped up version of Ocarina of Time hitting in June to dissect the rest of the year, plus of course whatever Miyamoto has planned for the 25th anniversary of Zelda. So, we’re not exactly lacking Zelda love this year. Skyward Sword was supposed to be the pinnacle, but I think, personally, I wouldn’t mind a delay to get HD impressionistic graphics. HD isn’t a deal breaker, but after seeing Twilight Princess and The Wind Waker in HD it’s just something I want sooner rather than later. The soonest we can get HD Zelda is the day Project Café launches. What about you? Do you want it to be delayed in order to see the graphics in all their HD glory?